In November of last year, i/o Ventures-backed Skyara launched a platform that was essentially the Airbnb for experiences, as it allowed those who are in the position to offer cool experiences like a culinary tour, beer tasting, or personalized yoga to hook up with those who want to try them. Skyara was the platform that would connect the providers with the fun-seekers. Since then, founders Jonathan Wu, Dennis Liu and Steven Ou have been working quietly on the platform, adding, iterating, and tweaking. As is often the case, the development process led to an early pivot, and the team is officially transitioning Skyara into a new product, called RAVN — which launches in private beta today. (Invites below.) Unfortunately for early Skyara users, the team will be either shutting down or redirecting Skyara in the near future. But this transition has not come without the help of outside investment. The team behind RAVN raised a round of seed funding, led by HillsVen Capital, allowing it to work on its new product in stealth mode over the last few months. Besides being “so raven” (sorry, I had to), what is it that RAVN brings to the table? 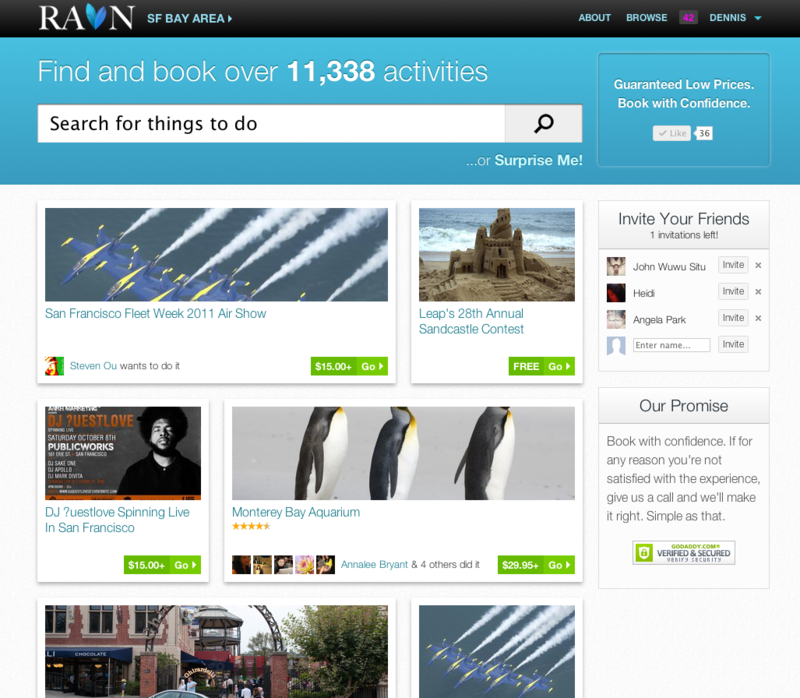 Put simply, RAVN is a search and booking engine for things to do. In other words, if you’re interested in activities, tours, events, classes, or leisure services, RAVN aims to make it easy to find those experiences and book them online. RAVN currently has a marketplace of over 13,000 activities, with a presence in the Bay Area, New York, Los Angeles, and Chicago, and the team is in the process of expanding to Hawaii, Washington DC, and Las Vegas in the next few months. If, for example, you’re interested in planning a wine tour in Napa, users can compare prices for different wine tastings, or plan a trip to one of Napa’s 22 free vineyards. Or, maybe you’re looking for a yoga class on a Thursday evening, so users can navigate over to RAVN to discover the top rated and most conveniently located studio based on your ability. Users can then book them in advance to save a spot in the class. As those savvy readers may be gathering, RAVN is the natural evolution of the process that began with Skyara: The founders want to create a new experience market similar to what Etsy did for craft fans. The intended audience is anyone who wants an answer to “What is there to do this weekend?” For those looking for a creative idea for a date, and want to quickly browse for ideas and get the ball rolling without having to pick up the phone, RAVN will be a valuable destination. Of course, RAVN will be (in some cases loosely) competing with other local discovery websites like Loku, Sosh, Gogobot, et al, but RAVN is hoping to build a platform that enables the closing of the loop for all local activities. Said another way: RAVN will allow users to discover activities, plan, connect, and schedule with friends, book direct — all in an effort to step away from the location-based daily deal vertical. To this end, RAVN will allow local businesses to create a business page on its platform to accept online bookings without any prior programming knowledge. RAVN pages are free to sign up and test, and once a customer books an activity through a business’ page, the startup will forward the customer’s information so that all businesses need to do is complete the service when the customer arrives at the scheduled time. That’s it. The startup is also distributing 200 beta invites to TechCrunch readers. To start testing out the platform, simply find your way over to RAVN and enter the code “TECHCRUNCH”. Then come on back and let us know what you think.